Whipclip’s app, which allows users to immediately and legally share clips from TV shows and other media, raised an additional $40 million in Series C financing. Led by asset management firm Eminence Capital, other investors include Institutional Venture Partners, Rain Ventures and content partners A&E, ABC, CBS, Comedy Central, Fox, Lifetime, Sony Music and Universal Music Group. Whipclip CEO Rich Rosenblatt, previously co-founder of Demand Media, states that some clips have been viewed millions of times. According to TechCrunch, with its group of content partners, Whipclip has been able to offer a catalog of shows from the outset; that catalog has now expanded and includes “Charlie Rose,” “Dancing With The Stars,” “NCIS: Los Angeles” and “Once Upon a Time” among others. The company also works with Turner, Viacom, Fusion, Pop and Bellator MMA for sports. Whipclip has partnered with more than 25 publishers that publish video clips in their online articles; among the examples are International Business Times, which embedded a clip of “So You Think You Can Dance” and USA Today, which added “The Bachelorette” recap. The app lets users create clips from the last two minutes of an airing show, a length that jibes well with the trend of consumers viewing short-form video on mobile devices. Whipclip also lets users access shows after they’ve aired, and enable posting of 30-second clips on social media platforms including Twitter and Facebook. Variety notes that other Whipclip investors include WME, Ziffren Brittenham, Greycroft, and individual industry execs including Ari Emanuel, Peter Guber, Steve Bornstein, Scooter Braun, Gordon Crawford and Ron Zuckerman. 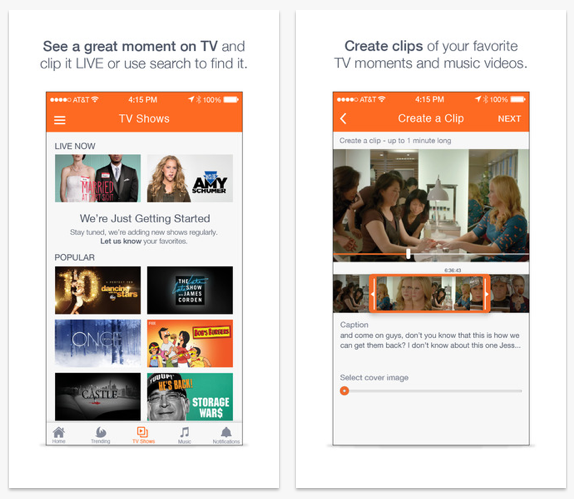 The recent Series C round brings Whipclip to more than $60 million raised to date. The company, co-founded by entrepreneur/former venture capitalist Ori Birnbaum, has 50 employees in Los Angeles and Tel Aviv.